Ken Timmerman, an investigative journalist and longtime friend of Religious Freedom Coalition Chairman William J. Murray, has written a powerful expose on Hillary Clinton’s lies about a YouTube video being responsible for the terrorist attack in Benghazi on September 11, 2012. 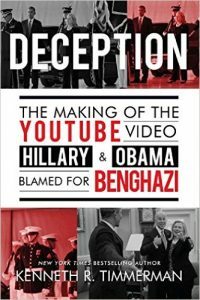 Timmerman’s book, Deception: The Making Of The YouTube Video Hillary And Obama Blamed For Benghazi is a scathing indictment of the Obama Regime for their lies about what was actually going on in Benghazi when four Americans were left to die without help from our armed forces. As news of the September 11, 2012 attacks in Benghazi reached the United States, Hillary Clinton’s State Department went into overdrive. But contrary to the story we’ve been told, they weren’t pulling out all the stops to rescue the diplomats, intelligence officers, and security staff holed up in the “secret” CIA Annex after the storming and burning of our diplomatic compound. Instead, they were doing their best to shut down a rescue effort – to get the gung-ho pilots and special operations troops to step down from their aircraft – and to put out a cover story many Americans now believe was cooked well before the attacks even began. It was all because of an “inflammatory” video on the Internet. Benghazi was a protest gone wild that had been provoked by “hateful” right-wing Christians in America who wanted to insult Muslims. After Hillary Clinton phoned President Obama at about 10 PM that night, here is the statement issued in her name by the State Department. The news media rushed to fill in the blanks, spoon fed by their sources at the State Department, the White House, and the Department of Justice. By the next morning, Americans woke up to scenes from the “hateful” video they were told unequivocally had “caused” the death of Ambassador Chris Stevens, communications officer Sean Smith, and two as yet-unnamed CIA security contractors. This is the story of an ugly lie, a dangerous lie that cost the lives of four Americans and only narrowly averted taking the lives of countless others. It is also the story of a well-orchestrated cover-up, aimed at diverting the attention of the media, the voting public, and Congress from the gun-running and secret intelligence operations in Benghazi, operations that went badly awry. This is a story that Hillary Clinton doesn’t want you to read. Order your copy of Deception today and access Ken Timmerman’s website for updated information on his expose of Clinton/Obama corruption.